Named for their shape, “dome” lights excel at delivering diffuse light in larger fields of view. 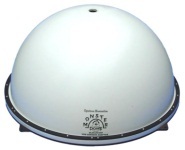 The molded fiberglass hemisphere reflects light onto your part from many angles. Shiny and irregular objects can be imaged free of shadows and hot spots. When imaging mirror-like surfaces, we suggest combining this light with one of our diffuse axial lights. Mount our diffuse axial light between the dome’s view port and a camera lens for optimal results. Please contact us if you’re interested in a super-high output version, various controller options, a longer cable, or a high-flex cable. Cable Length: 4.0 m (13.1 ft) Optional 8, 15 and 30 meter standard cables; 4, 8, 15 and 30 meter high-flex cables.